Purina Pro Plan Veterinary Diets HA Hypoallergenic Dry Dog Food is a complete veterinary diet that helps to nutritionally manage food allergies in dogs of all ages, including puppies. 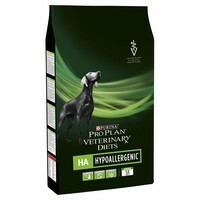 A true hypoallergenic diet, Purina HA has been formulated with protein that has been broken down (hydrolysed) into very tiny components that are too small to cause an allergic reaction, and a purified carbohydrate source. Purina HA Hypoallergenic is also useful for dogs with severe bowel conditions, such as Inflammatory Bowel Disease, as it is highly digestible. Good product, usually arrives promptly and much cheaper than elsewhere.